If you were concerned about your car being stolen, how would you feel? Nervous? A little uncomfortable perhaps? Would it play on your mind? Not pleasant, that’s for sure. Now imagine you are a car dealership with dozens of brand new vehicles sitting on your forecourt. How would you feel then? Lose your business stock, and you don’t have a business. Sure, insurance should take care of the material loss, but what about the loss of trade and goodwill? What happens to your customers if they can’t buy from you? Your competitors rub their hands together and welcome your customers in. Essendon Ford had such concerns and decided to address them. 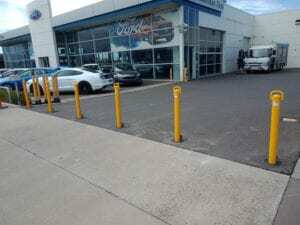 Essendon Ford needed advice on protecting their valuable stock of vehicles, and so they contacted SHUG Bollards. SHUG recommended the installation of a row of removable bollards. The beauty of these bollards is their strength and versatility. 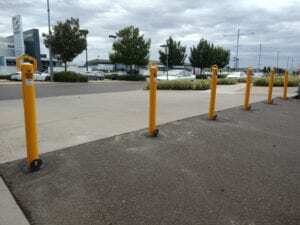 Slot a removable bollard into place, and you can prevent vehicle entering or leaving the premises. However, once a removable bollard is unlocked, it can be lifted out easily to allow vehicular access when needed. Exactly what Essendon Ford needed. SHUG’s convenient installation service was a great help too, so it was business as usual for Essendon. Vehicle theft is a growing problem, and it can affect all of us in one way or another. If you have similar concerns about your vehicle(s), contact SHUG today for advice. SHUG supply and fit a range of bollard solutions, and we are confident that we have the right one for you.